Three Ring Circus Modus Operandi--swinging from one project to another. I have been testing a new way of operating. I call it The Three Ring Circus Modus Operandi. 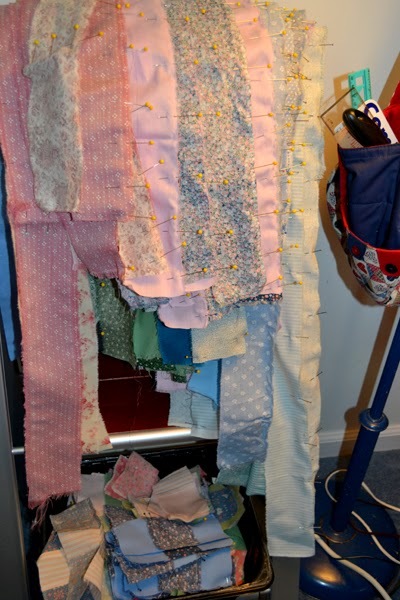 I have borrowed bits from Bonnie K. Hunter and Teresa Rawson, who are both avid and well-organized quilters, and added a bit of my own individuality to come up with a functional work model that will hopefully function for me. Both of these women have much experience and knowledge when it comes to organizing themselves and their materials to maximize their creativity. Do check them out, if you find yourself, like me, bogged down with too many projects, unable to use your time wisely or find yourself unable to find what you need when you need it in all your sewing stash. 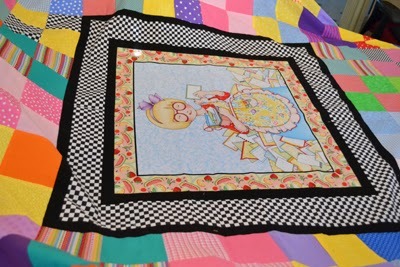 Their writings have convinced me that I CAN, in fact, sew projects bigger than pincushions and fleece socks, though I have never been one to make something start to finish if I can help it, especially if it is a long term project, like a quilt. I am not exactly sure why this is, but I think it has something to do with being a perfectionist. I take my time when I create anything, and though I can stick to something for a very long while, I find myself more creative when I take a pause to let allow a project to speak to me as to how to best proceed, while I go about doing other projects. 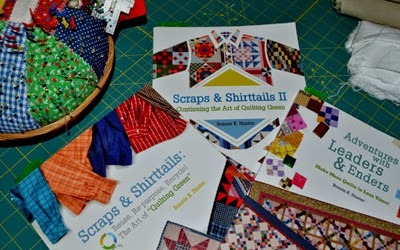 I knew how to organize myself and my materials to do multiple small projects but am now learning to organize my large ones as well, making changes in my studio spaces to better facilitate not only finishing my several partially done quilts but creating new ones as well. The first change I made was to pull out all of my unfinished projects, and write a plan for each of them, including pictures or sketches, noting where I have left off and what is next. I then put the plan in a plastic sleeve and put it in the bin or basket with the materials needed for that project. This is actually Teresa Rawson's idea, but what convinced me to actually do this was a comment made to me at a sewing sale. 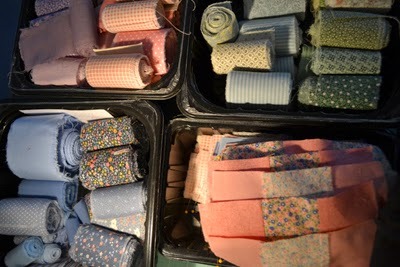 I joked about cutting up all of my materials before I die while I was shopping at a large sewing estate sale. One of the people running this sale overheard me and rather curtly replied that she didn't think my comment funny. She went on to tell me, in no uncertain terms, to be sure to keep my projects sorted and bagged, in kindness to those that would be selling my wares following my death. Apparently she knew the habits of sewers from putting this sale together...that we always have too much to ever finish and apparently never wanted to again do the sifting and sorting that it took to organize her poor deceased friend's sewing goods. It was a point well-taken. I have no guilt now. Whatever project is done or not done, it is altogether so another can pick it up if they choose and have the materials needed to complete it. 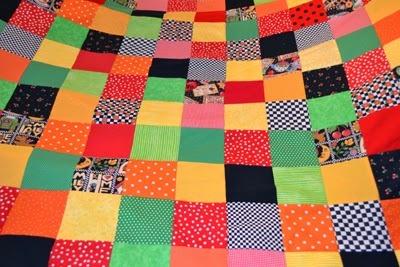 I also laughed with friends, telling them that completing my seven unfinished quilts in my lifetime seemed an impossible task until I considered making more quilts and not less. My unfinished seven didn't seem like so many then. Crazy? Completely!! Yet, how many of us have beautiful work started that we are less than inspired by as we look at new patterns and new materials? It is enough to make me give up sewing altogether if I consider doing nothing but finishing my old projects without keeping my creativity sparked as I consider new ones yet to come. My Three Ring Circus Modus Operandi takes these foibles and eccentricities into consideration. I also have come to realize that I am sewing for therapy and fun. Anyone that has been reading my blogs for a long while, knows that I have Chronic Lyme Disease, took a medical leave from work, was sick enough that I decided that it was now or never to create what I always wanted; organized a studio space in my basement; and then another in my dining room; and set up a small work table in front of the TV in my living room with thread and notions in and on top of a little set of drawers next to my table and went to work. I started by creating a pincushion, and then another and another, and when I had too many pincushions, I found markets to sell them. 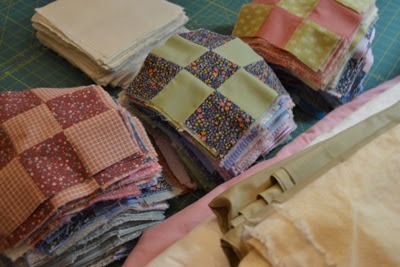 I then created a blog and an Etsy store and the rest is history, except for finishing my quilts. I have finally gotten brave enough to consider a plan that allows me, God-willing, to complete them, and design more, while still doing other small sewing projects too. None of this would likely have happened had I not needed to keep busy and my attention diverted away from my rather difficult and seemingly endless medical protocol. Though I love to embroider, sew and create, it reminds me that there are blessings to be found in whatever circumstances find us, as I continue to contend with a body that doesn't always do what I want it to do. I have good days along with some that aren't so great, and schedules that are often backwards and have to content myself with goals that must be as flexible and varied as my daily capabilities. Back to my new modus operandi that I started in January. 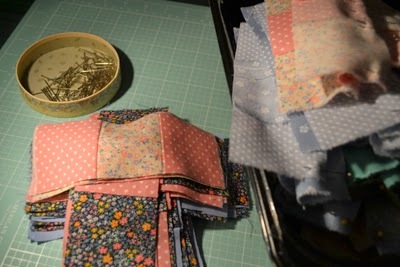 I am sewing on three projects at a time. This keeps me sewing all the time, but offers me three projects with different tasks to be completed. One of the three projects includes something unfinished that I will at least take to the next level in the process of it's completion. The second is working on a new or newer project. The third project is doing what Bonnie K Hunter suggests as having "a Leaders and Enders" basket of machine patchwork going placed right by my sewing machine. It is her way and quickly becoming my way of continually doing piecework for quilts to come. Prep work to do Leaders and Enders work. Leaders and Enders work becomes my favorite work. Prep work is often part of having such a basket next to my sewing machine and so occasionally prepping materials by cutting, pressing and pinning are part of this third project. 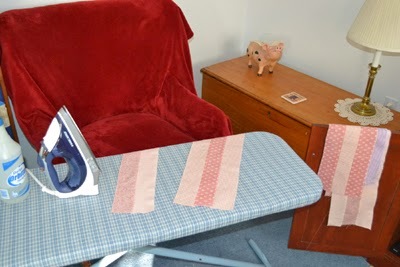 I have added a portable ironing board to my living room so I have a pressing station as well. All of these steps are rather mindless activities, that I do when I simply want some busy work in front of the TV. I do admit that I am the one that mostly lives in my living room, though I have a sofa and a vacation chair cleared for whoever will sit and watch TV with me as I sew. My husband has his "man cave", which has been a sound investment and allowed for my Operation Sewing Creep all over the house excepting the bathrooms, bedrooms, kitchen and his cave. 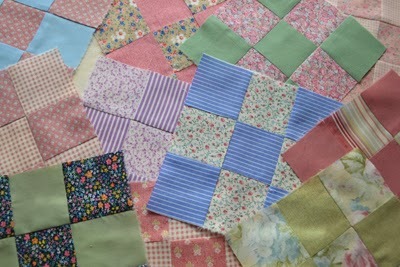 Strips of material sewn together to make fast 9 Patch quiltblocks. The past few months my three projects have been: 1) to finish my daughters' patchwork duvet covers--Christmas gifts past due 2) to design, cut out and applique the top of a wall hanging for a friend using Teresa Rawson's freezer paper instruction on her website and 3) Bonnie K Hunter's Leader and Ender machine on-going patchwork-- nine patch blocks for upcoming nine patch quilt top(s). #1 Ring: Center piece later appliqued to black sheet for duvet cover. 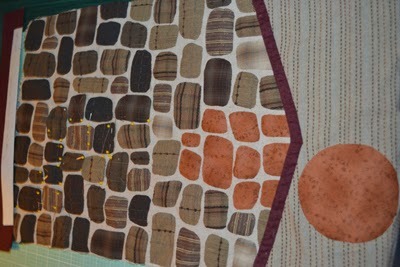 #1 Ring: Patchwork side of above the above duvet cover. #1 Ring. Second duvet cover, front side. #2 Ring: freezer paper, hand- appliqued wall hanging using Japanese fabric. #3 Ring: 9 patch squares for 9 Patch, 9 Patch quilt(s). Leader, Ender work. Enough 9 Patch blocks to do 2 9 Patch quilt tops. I also use a diary to organize myself before I get out of bed. I can save my needed energy everyday by visualizing what I am going to accomplish. By having three projects going, I simply decide which one I am going to work on, and can then sew guilt free without thinking about another. I do find that some projects require a pause to problem solve the next step. This can be done rather passively when I am sitting and mindlessly working on another project that is more "brainless". Some tasks can overwhelm my low energy levels, and thinking ahead helps me break them down into smaller steps that make them more do-able. 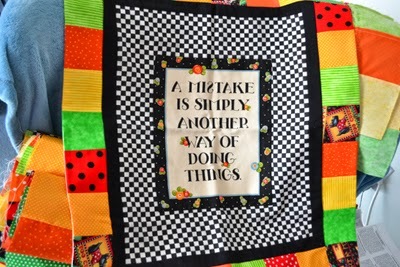 I am learning that I often sew on what is easiest, procrastinating taking on more challenging processes, though sometimes a good challenge is just what I need. By having three projects going at a time, invariably one gets done before the others, but no matter, as all three will reach either their end or their next step before moving on to new goals. Goals, for me, are not necessarily finished projects but rather taking them to the next level, especially when working on long-term projects. I will report to you, my readers as to how this Three Ring Circus Modus Operandi is working. I have only been at it a few months now. No plan is perfect. If you are a multiple-project sort-of-person like myself, it can be easy to feel very scattered and I am hoping that this plan will keep me focused and goal directed, without losing the fun of being spontaneous and creative! 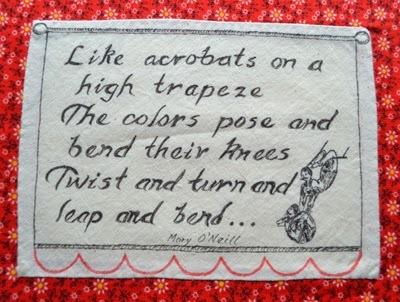 Like the circus performer that I always wanted to be, I have three rings to perform in, and how exciting it is to think of myself as hanging by my knees and swinging into my next project!...My imaginings of being a circus performer are best left to another blog however, one about how Walter Mitty and I lead exciting virtual lives! Can you tell that I was a special education teacher that used to write IEPs (individual educational plans) with goals and objectives?... "Let no skill, or knowledge go to waste," is my motto, especially when you become older and have needs that can no longer be ignored. Aren't we all special with unique needs?